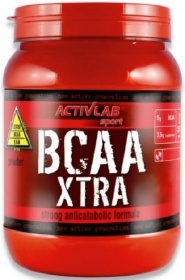 Have a question about BCAA Xtra? What is it, what does it do, how and when to use or something else? Ask us. Other Ingredients: L-glutamine, L-leucine, L-valine, L-isoleucine, acidity regulators citric acid and sodium citrate, flavoring, sweetener E950, colors: E104 (lemon, and orange flavor), E110 (flavor, grapefruit and orange), E124 (grapefruit and cherry flavors). Take 10g (2 teaspoons) dissolved in 250 ml of water shaking in a water bottle. 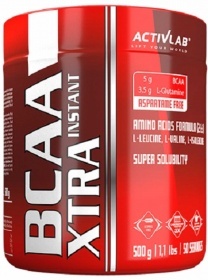 On workout days: 10g serving before your workout and 10g after training. On non-workout days: one serving of 10 grams before meals.